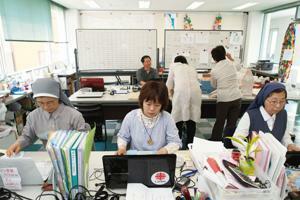 Caritas Japan set up the Sendai Diocesan Support Center to coordinate relief activities. On Sunday March 11 this year, it will be one year since the Great East Japan Earthquake. This earthquake was the most serious disaster involving the whole area of eastern Japan since the Great Hanshin-Awaji Earthquake, which occurred 17 years ago on January 17, 1995. I request that the Catholic churches across the country hold masses and prayer gatherings in commemoration of victims and for the earliest possible reconstruction of the disaster areas. What happened on March 11, 2011 will never be forgotten in our lifetime. The earthquake, which was huge in size and long in duration, left us astonished. Immediately after that, tragic news was successively received and even those who were not directly hit by the earthquake were also deeply shocked. Especially, the horrific tsunami killed nearly 20 thousand people and caused immeasurable damage. Moreover, the accident in Fukushima nuclear plant uprooted the daily lives of numerous people and frightened them with the threat of radiation. After this earthquake, however, we could recognize how wonderful it is for people to support each other. It was reported on TV that immediately after the news of the earthquake spread in neighboring Korea, young people on the streets held placards written in English “We love Japan. Japan will overcome the hardship!” Donations were sent from all over the world. Moreover, specialists overseas with expertise and advanced knowledge and skill began to offer generous support in order to keep the damage of the nuclear plant accident to a minimum. Domestically, people from all over Japan came to the afflicted areas, and engaged in volunteer activities such as preparing meals and removing rubble, and spoke to each one of the afflicted people. Facing unreasonable and cruel realities, we are largely impressed and encouraged by numerous people at home and abroad who are making every effort to help the affected persons. The address of the king of Bhutan at the Diet was also unforgettable as warmhearted encouragement and support to the disaster areas and all of Japan. By the way, on the very day of the Great Earthquake, there were moving stories of those who saved other persons’ lives at the cost of their own, which might have inspired people to offer heartfelt support. For example, one owner of a company tried to tell all of his young Chinese employees, who stayed in his company for training, that they should flee to a nearby hill. He himself did not evacuate, so he was swept away by tsunami and died. Meanwhile, one announcer of a municipal cable broadcasting station continued to call for immediate evacuation through a microphone in her office. She worked desperately to save people’s lives, and because of that, she herself was swept away by tsunami. It has been almost one year since the earthquake, tsunami and the nuclear plant accident brought about the sorrowful and heartbreaking situation. As Catholics, let us pray that the victims will be given eternal repose in the hands of God, and the disaster areas will be reconstructed as soon as possible so that the afflicted people can rebuild their lives. On the occasion of the first anniversary of the Great East Japan Earthquake, we Japanese bishops will celebrate masses with people in each diocese on March 11 to commemorate the victims and to pray for the reconstruction of afflicted regions. In addition, a prayer gathering is planned to unite and pray with the people of other Christian denominations. It is my wish that these masses and prayer gatherings will be held and a lot of people will be able to pray together across the nation. It is certainly important to join these official prayers, but I also encourage all the faithful to continue to offer personal prayers. The Catholic Church in Japan has received donations to help reconstruction from Japan and the Catholic churches of various nations. Making the most of these donations, the volunteer activities mainly organized by Sendai Diocese and Caritas Japan are carried on together with non-Catholic people. Reconstruction efforts by men and women religious institutes and the three ecclesiastical provinces are also going on. The volunteer activities mainly conducted by the faithful of each diocese are gradually being put on track. These volunteer activities for reconstruction will be carried on for many years to come. Therefore, volunteers for those activities are continuously needed. I request you to keep on supporting reconstruction through prayers and activities in the future as well.